Winter’s wild landscapes are worth breaking out the snowshoes, but if you’re new to the sport, venturing into the backcountry alone might be intimidating. You’ll find yourself among friends at Elk Knob, the only North Carolina state park that aims to attract snowshoers and cross-country skiers. The park perches above 5,000 feet near the snow-prone Tennessee border, almost 10 miles north of Boone. 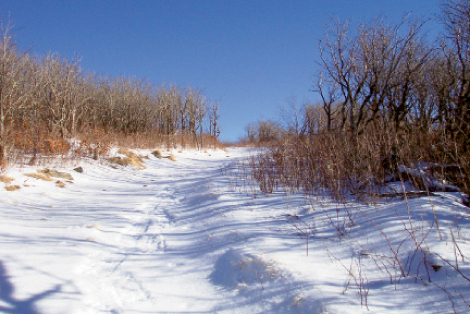 Last fall, after more than 6,000 hours of labor, a snowshoe trail opened to the top of Elk Knob. The Summit Trail’s two miles of gradual, well-marked switchbacks ease the 1,000-foot climb. The smooth, rock-lined route ascends a final, steeper stretch to a clearing surrounded by stunted, wind-whipped beech trees. Head out on a clear day and the views are impressive. A who’s who of summits encircles the mountain. To the north is Mount Rogers, Virginia’s highest, with towering Grandfather to the east and Roan Mountain in the west. Looking south, a distant Mount Mitchell is flanked by Sugar and Beech mountains, streaked with ski runs.